influenced by both freshwater inputs from rivers (to its east-side) and fast mixing exchanges with the Atlantic Ocean through a narrow (1.8 km of wide) and deep (40 m) channel. The average flushing time of the system is around 25 days. The shallowness of the bay and the water mixing induced by tidal currents prevent the ecosystem from vertical stratification and nutrient accumulation and therefore limit eutrophication. This environment is still very rich and shelters numerous species, macrobenthic communities and remarkable habitats (for instance: maerl beds, scallops and brittlestars sandy-shelly muds, flat oysters beds associated with black scallops, slipper limpet mixed sediments, zostera beds, intertidal pacific oyster population...). This ecosystem is pressurized by human activities: the northern part is bordered by the city of Brest, which includes 400 000 inhabitants whereas the southern part is dedicated to intensive agriculture. Marine resources are exploited by professional fishing, shellfish aquaculture and recreational activities (diving, fishing and picking). 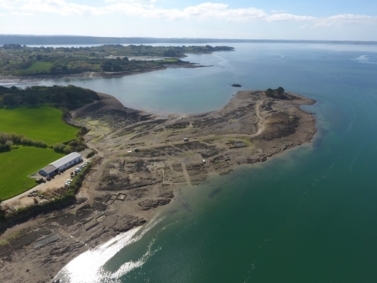 One of the most productive areas within the bay of Brest is the Daoulas bay – a shallow embayment (max depth 8 m) - that receives the freshwater inputs of « The Mignonne » river. This bay harbors various aquaculture and fishing activities and also a marine protected area (Natura 2000). The observatory of the Bay was deployed in 2006. This observatory system now includes a real time monitoring of temperature, salinity, in vivo fluorescence (chlorophyll a), oxygen concentration, pH and turbidity. For further details, see Petton et al (2016), Marine environmental station database of Daoulas bay, SEANOE, http://doi.org/10.17882/42493. The bay of Brest is a temperate ecosystem. Seawater temperature recorded at the experimental site varies from ca. 8°C during the winter to 18°C during the summer. Salinity fluctuates between 24 to 31 psu during the winter and remains quite stable at ca. 32 psu during the summer. 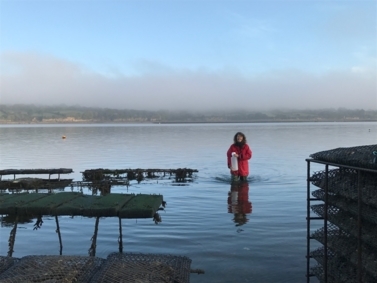 The two main shellfish aquaculture activities in the Bay of Brest are mussel culture (bouchot mussels, Mytilus edulis) and oyster culture (flat oyster Ostrea edulis and Pacific oyster Crassostrea gigas). The areas of exploitation and production (spat) are mainly located in rias and inlets. The mussel M. edulis has been severely hit by massive mortalities in the Bay of Brest in 2014 and onward. These mortalities were associated with a Vibrio strain pathogenic bacteria. Estimated losses varied between 30% and 80% depending on the year. The flat oyster O. edulis is the native oyster species of the Bay. However, since the late 1970s onwards, heavy mortalities were observed on the natural and livestock banks of O. edulis in the Bay of Brest and elsewhere in France. The French production of flat oyster has decreased by 10 times from 20000 tons to 2000 tons. These mortalities were attributed to the parasites Marteilia refringens and Bonamia ostreae. Since then, flat oyster beds have never recovered and the overall French production remains at 1500 tons per year. from Canada and Japan from 1971 to 1977 (Grizel & Heral, 1991). French production ranks fourth in the world with more than 116,000 tonnes produced in 2006 (FAO, 2006). This production represented 3,113 enterprises in 2001, which operated 11,648 hectares. While the recruitment of C. gigas was initially confined to the south of the Loire River, from the mid-90s onwards, breeding episodes multiplied in sites further north in Brittany and colonization now extends on the Channel. The Bay of Brest is now densely colonized by C. gigas, with densities of up to several hundred oysters per square meter (Lejart, 2009) and wild stocks largely dominate the cultivated stocks. Since 2008, massive mortality events in C. gigas oysters have been reported in almost all farming areas in France including the Bay of Brest (EFSA 2010). These mortality events are associated with the infection of oysters with a newly described genotype (µVar) of ostreid herpesvirus 1 (OsHV-1) (Segarra et al. 2010). Risk factors for OsHV-1 transmission have recently been recently reviewed (Pernet et al. 2016; EFSA 2015; Barbosa Solomieu et al. 2015). Seawater temperature set the start and the end of OsHV-1 epizootics occurring every year in Europe between 16°C and 24°C (Pernet et al. 2012; Renault et al. 2014; Oden et al. 2011). Low salinity (<15 psu) decreases the risk of OsHV-1-induced mortality by reducing virus infectivity (Fuhrmann et al. 2016). Proximity of oyster farms, biomass of infected oysters and seawater residency time were all associated with increased risk of mortality caused by OsHV-1 (Petton et al. 2015; Pernet et al. 2014a; Pernet et al. 2014b; Paul-Pont et al. 2014) Age, genetic background, life-history traits and physiological status of oysters potentially influence the spread and the magnitude of OsHV-1-induced mortality (Pernet et al. 2016; EFSA 2015; Barbosa Solomieu et al. 2015). Finally, the frequency of detection of V. aestuarianus during oyster mortality outbreaks in France has increased markedly since 2012, suggesting a (re)emergence of this pathogen that may be partially explained by an increased susceptibility of the host to V. aestuarianus, and/or environmental factors favoring the multiplication, persistence or virulence of the bacteria (Barbosa Solomieu et al. 2015). Farming of clam (Ruditapes philippinarum) is now of minor importance since the early 1980s when brown ring disease (BRD) outbreak (Paillard et al. 1994; Paillard 2016a; Paillard 2016b). V. tapetis strains have been isolated in the rade of Brest in 1993 in manila clams affected by BRD (Allam et al. 2000). The BRD prevalence in clams in the rade of Brest reached in maximum 30% in some sites of Daoulas.